This easy and delicious BBQ chicken salad wrap filled with greens, black beans, corn, and crispy tortilla strips makes one of our favorite salads wonderfully portable and convenient to enjoy on the go! 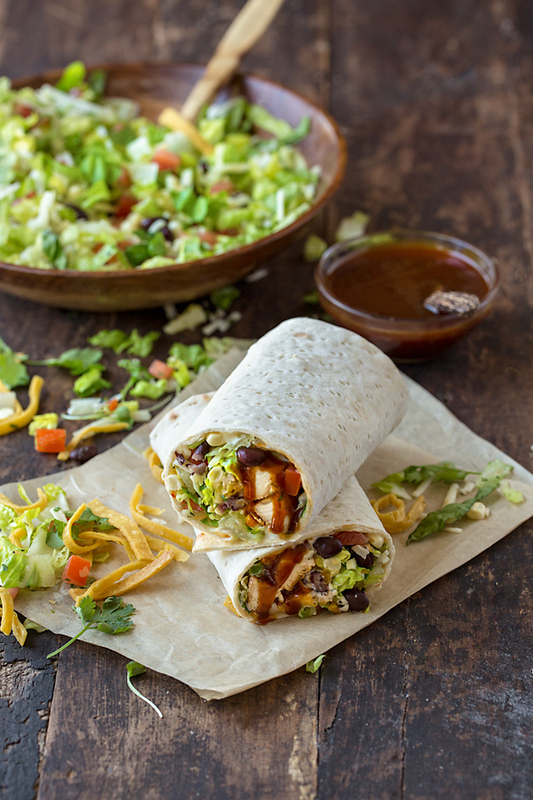 BBQ Chicken Salad Wrap, a Fresh Wrap to Grab and Go! I’ve always been a big fan of a quick, cool sandwich wraps, the kind filled with fresh greens and crisp veggies, a flavorful sauce, perhaps a little sprinkle of cheese, and a bit of lean protein. 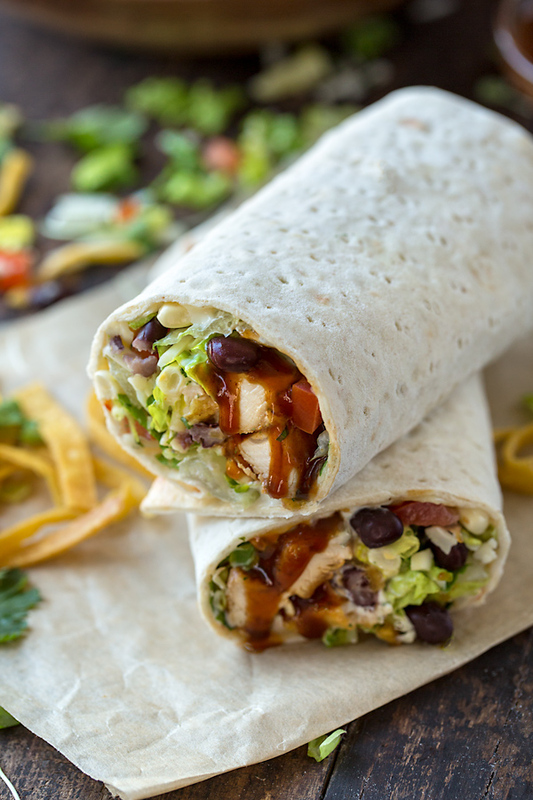 And because I adore BBQ chicken salad, which already includes the chicken, the sauce, and all sorts of tasty little bits like black beans and corn plus those cool greens, I love the idea of combining the two to create a BBQ chicken salad wrap—it’s a tasty little sandwich that’s the best of both worlds! For this scrumptious recipe I simply like to combine strips of tender, juicy seared chicken with a bit of my favorite smoky BBQ sauce. Because I like a little crunch, a lot of color, and both sweet and savory flavors as part of this delicious little package, I add in chopped romaine, some corn, tomatoes, black beans, a tiny handful of homemade crispy tortilla strips, plus a sprinkle of pepper jack cheese. I even drizzle over some of my zesty homemade cilantro-lime ranch dressing—so creamy and delicious! 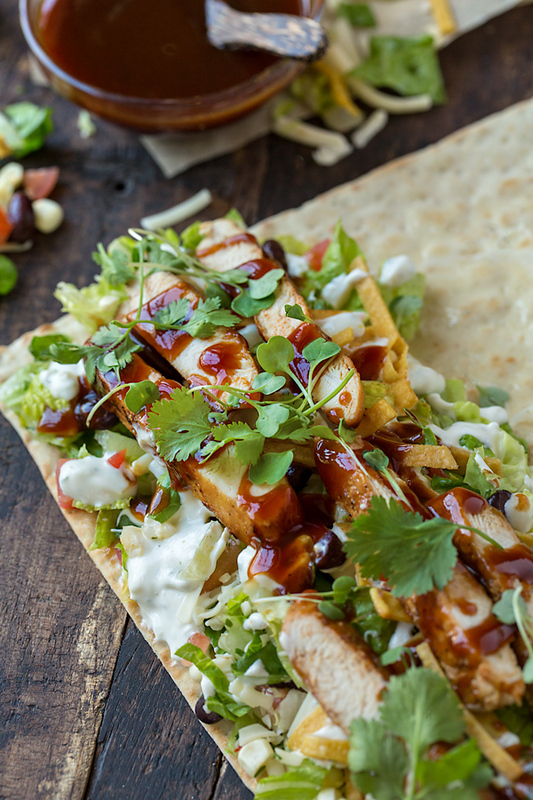 This crunchy BBQ chicken salad wrap is fresh, hearty and super flavorful! But one of the best parts? It’s so easy to prep and roll up! Whenever I prepare my homemade wraps such as this Grilled Lemon Chicken Flatbread Wrap, this Thai-Style Peanut Chicken Wrap, or these Grilled Chicken Kebab Wraps, I like to use either pita bread, Middle Eastern flatbreads, or lavash to wrap everything up in all nice and snug. Any of these are super convenient, and it really just depends on your personal preference. There’s even lot’s of gluten-free options to be found in the markets these days as well! But my personal preference is to use lavash for this wrap. I prep my cilantro-lime ranch by whisking together my mayo, sour cream, lime, garlic, and cilantro. I chop up some romaine, and prep my other ingredients such as the corn, beans, tomatoes, and the cheese, and toss those together in a bowl to combine. Then I lay all the ingredients onto my lavash, beginning with a bed of the greens mixture, and then a drizzle of my ranch; I follow that up with the tortilla strips, the chicken, and finally a generous drizzle of BBQ sauce (and a bit of added cilantro!) and roll tightly to seal. Finally, I cut it in half, and enjoy! The chicken: I like to use chicken breast tenderloins for a recipe such as this, because they are smaller and quick-cooking. I simply sear (or grill) them in a pan. You can even cube up some rotisserie chicken if you’re pressed for time! Tortilla strips, totally optional: Because I like a bit of extra crunch in my BBQ chicken salad wrap, I like to add super thin and crispy homemade corn tortilla strips; but you can totally leave these out, or even use store-bought strips if you can find them. You can even crush up some tortilla chips if you prefer. Your choice of greens: Chopped romaine is hearty, cool, and crisp for this wrap. But you can use arugula, iceberg, butter lettuce, watercress, or a combination—whatever your favorite greens are! Pepper jack cheese for spice: A sprinkle of pepper jack cheese is a creamy and mildly spicy addition to this wrap. But you can sub cheddar cheese, plain jack cheese, or even mozzarella—your choice. Cool and fresh, this BBQ chicken salad wrap is filled with greens, crispy tortilla strips and a zippy cilantro-lime ranch for a convenient grab and go meal! –Begin by preparing the ranch dressing: in a small bowl, whisk together all of the cilantro-lime ranch ingredients, and keep cold. –If preparing the tortilla strips from scratch, add just enough oil to a small skillet (about 1/2 cup), and heat the oil until hot; once hot, add the tortilla strips and fry just until golden and crispy, about 1-2 minutes; drain on paper towel, and sprinkle with a touch of salt, and set aside. –Sprinkle the chicken breast tenderloins with salt and pepper, and sear them in a hot pan for about 3-4 minutes per side, or until cooked through. Allow to cool, then slice into thin strips. 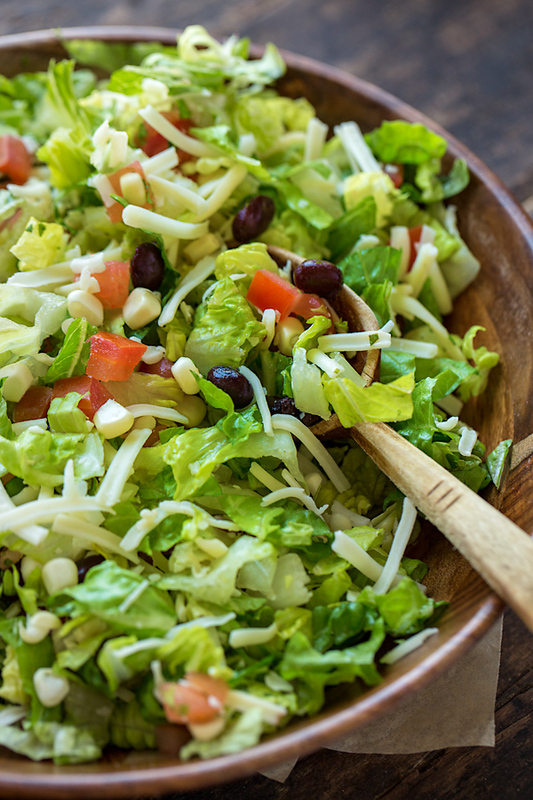 –To prep the salad greens mixture, add the chopped or shredded romaine to a bowl, along with the pepper jack cheese, the corn, the black beans and the diced tomato, and toss to combine. –To assemble, lay a lavash wrap on a work surface so that the longer side is horizontal in front of you, and add about 2 cups of the salad greens mixture, followed by a generous drizzle of the ranch dressing (about half, or 4 tablespoons), then a sprinkle of the tortilla strips, and about half of the chicken strips; drizzle with some of the BBQ sauce, and sprinkle with cilantro leaves. –Carefully roll the lavash upwards tightly and allow the wrap to rest on its seem; repeat with the second lavash. –Then, cut the wraps in half and enjoy with some of your leftover tortilla strips, or place the wraps onto a plate, cover with plastic wrap, and keep chilled in the fridge until ready to serve. 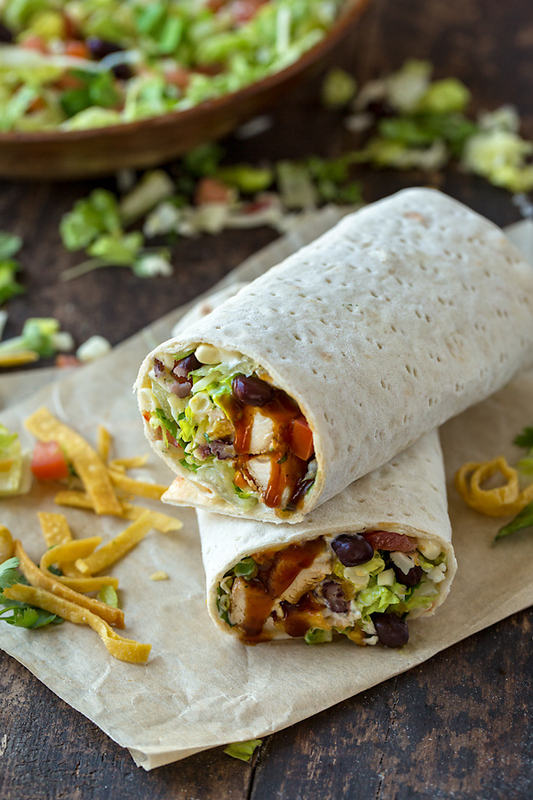 Interested in more wrap recipes? 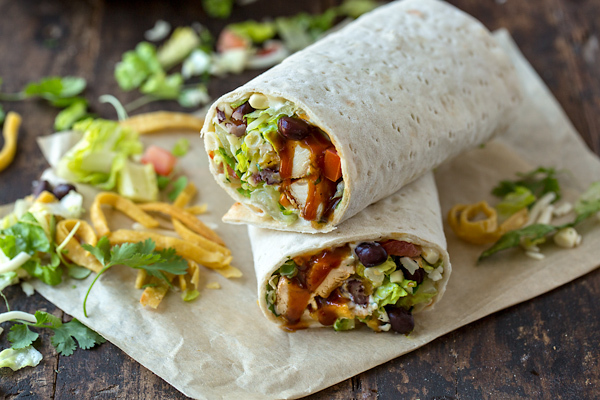 Check out this Falafel Wrap, or this Crispy Chicken Strips Flatbread Wrap! I’m going for vacation in outback Australia next month so finding recipes that will make things easy. I think these will be great if I make enough for a couple of days to have ready to grab while on the road or when busy sight seeing. Thanks you. Pinning it.